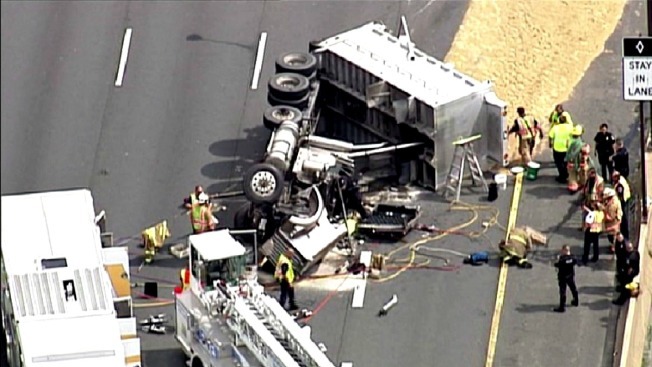 A dump truck overturned on Interstate 270 in Rockville, Maryland, causing severe traffic problems Wednesday afternoon. HOV restrictions were temporarily lifted in the area to help ease congestion from the crash, the Maryland State Highway Administration said. The truck overturned near the exit for Montrose Road about 2:30 p.m., according to Montgomery County police. All lanes reopened by 5:15 p.m., but there were still major residual traffic delays. A man and a woman from the overturned truck were taken to a hospital but are expected to be OK, according to Pete Piringer, a spokesman for Montgomery County Fire and Rescue Service. He said a third person was evaluated by medical personnel at the scene. Police said several vehicles were involved. Sand from the truck was spread across the road, and the resulting traffic delays stretched all the way to the Beltway.